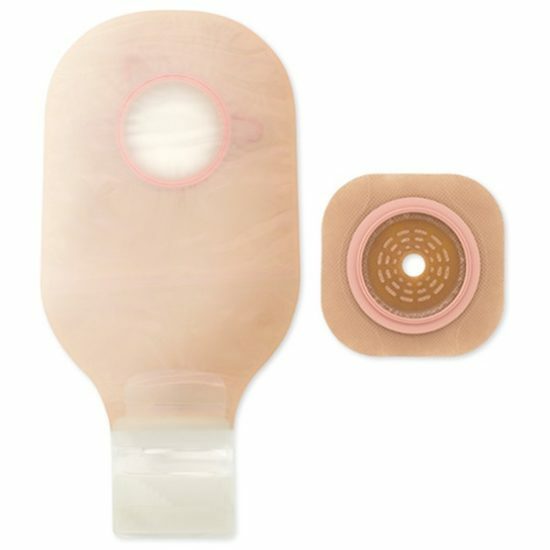 Ostomy kits contain key items needed for one pouch change, including pouch, skin barrier, stoma measuring card, and instructions for use. The drainable pouching system is designed to be opened at the bottom when emptying. These pouches are most suitable for colostomies or ileostomies. The CeraPlus Skin barrier is infused with ceramide, the skin’s naturally occurring protection against dryness. The Lock ‘n Roll microseal closure utilizes plastic interlocking fasteners to create a secure closure at the bottom of the pouch. Soft, beige ComfortWear pouch panels on body side help provide comfort.